I know, I know…this isn’t a quick recipe but it’s not hard if you get set up correctly and plan your timing accordingly. If you don’t have a large, heavy duty electric mixer, after stirring in the risen sponge and the candied fruit, knead the rest of the flour in by hand on a heavily floured work surface, using a pastry scraper as your aid. And, if the scraper ever gets coated in dough, rub some flour onto the sticky blade—which will help the scraper keep from sticking to the dough, while kneading. It’s important to bake the panettone fully—so that the center of the loaf is fully cooked. This is why I give such a wide temperature range (60 to 90 minutes!). And it’s also why this is the only bread recipe where I suggest using an instant thermometer (and baking until an internal temperature of 190F and 205F is reached)–especially since these loaves will become brown long before they are done baking. The toothsome texture of this panettone is hauntingly good and is particularly great when made with homemade candied citron (either alone or in combination with other homemade candied citrus. My favorite way to enjoy this wonderful loaf is sliced, toasted and served with cream cheese for breakfast! Place 1 ½ cups raisins into a small, nonreactive saucepan and add the rum. Heat the liquid until it just starts to bubble, then turn off the heat, stir the contents and allow the raisins to macerate for 30 minutes to 1 hour (or longer). Drain and reserve the rum and raisins separately. While the raisins steep, heat one cup milk with 2 tablespoons water and, when just warm to the touch, stir into a 2 ½ to 3 quart mixing bowl. Stir in the honey, and then sprinkle on the yeast. Let the yeast dissolve naturally for a few minutes. Once dissolved, add 2 cups bread flour and stir vigorously for 2 minutes, creating a mixture that is smooth and seemingly elastic—(stir briskly). Scrape down the sides of the bowl and cover the bowl with plastic wrap. Drape a clean kitchen towel over the top of the bowl and let it rest in a warm, draft-free spot for 1 hour. Using an electric mixer fitted with the paddle attachment, cream the softened butter with the sugar and salt. Beat the eggs and yolks with 1 teaspoon vanilla in a measuring cup (with a spout) using a fork. When the butter is light, add the beaten eggs a little at a time, beating well after each addition. While beating in the eggs, gently rewarm ½ cup of the reserved rum in a nonreactive saucepan. Add to the mixer bowl, the sour cream, warmed rum, citrus juice and zest and beat until combined (expect the mixture to look quite curdled at this point—this is fine). Turn the machine off and scrape down the bowl as necessary. Uncover the sponge and, after stirring it down, add the entire mixture to the mixer bowl. Turn the machine back on and combine well. Add 2 cups of bread flour and mix until smooth and glutinous. Add the drained raisins, the citron along with the candied cherries and beat again until incorporated. Add another cup of flour and beat it in well. Add one more cup of flour, this time in ½ cup increments, beating in each before adding the next. Beat again until well combined. Turn the machine off and scrape the dough from the paddle. Place the dough into the buttered bowl. Brush the top of the dough with melted butter and cover the bowl with well-greased plastic wrap and a clean towel. Place in a warm, draft-free spot to rise until billowy and almost double in bulk, about 3 hours. You have a timing choice. Although you can shape the dough now, for the best, lightest, texture and a more developed flavor, punch the dough down, turn the dough over in the bowl and recover the dough to let it rise again for about 2 hours. If timing is an issue, either skip this second rise or punch down the dough and shape the dough as directed but allow it to rest in the refrigerator overnight (covered with a towel and then with a sheet of plastic wrap). The next morning, allow the dough to reach a billowy state, which can take several hours to accomplish. Preheat the oven to 375F for 30 minutes before baking. Glaze the top of the risen dough with an egg wash made by mixing 1 egg with 1 tablespoon milk, 2 tablespoons reserved rum from soaking raisins and ¼ teaspoon vanilla—Strain this into another small bowl. (Depending on how long you’ve macerated the raisins, this will determine how much rum you will have reserved. If you don’t have enough, just add two more tablespoons rum to the glaze.) 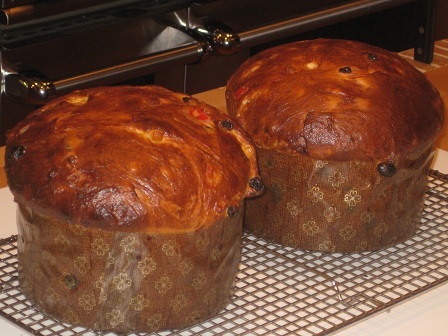 Bake the panettone in a preheated 375F oven until an internal temperature reaches between 190F and 195F when an instant thermometer is inserted deeply into the top center, 60 to 90 minutes. (After about 20 minutes, once golden, cover the loaves loosely with foil (shiny side up) and continue to bake this way. Bake uncovered for the last few minutes. Let cool completely on the wire rack. To slice, cut the loaf in half through the paper, then peel off the paper and place each half of the loaf (cut side down) on a cutting board. Cut into thin slices.